If you often do baking, than a simple cheap stand mixer will be a really helpful assistant in your kitchen. First, you can easily whip the eggs to the desired condition. The second application: easy and quick preparation of dough for muffins, biscuits, blondies. And, of course, such mixer will save you time and effort while preparing any creams. Another dish that this mixer will perfectly handle is mashed potatoes. 1. Power. How many watts is needed for the stand mixer to function properly? It is about 300-350 watts. This is really enough to whip eggs, cook a cream or not very thick dough. 2. Bowl capacity. 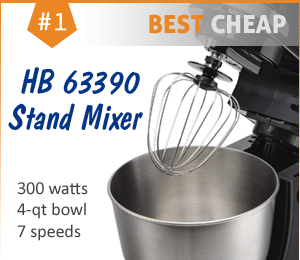 3 or 4 quarts are common for stand mixers in this price range. 3. Attachments. Usually, the mixer comes with the flat beater(s) for general mixing. Balloon whisk for whipping and dough hook for kneading are often included. How much is stand mixer and what stand mixer is the best? Here we will consider only best-rated cheap stand mixers under $100. But if you can spend more, you should pay attention to the recognized leader in this category – KitchenAid. However, the price of the KitchenAid’s cheapest mixer starts from $180. And the absolute winner, which received national recognition, is KitchenAid KSM150PSER, which costs an average of about $250. 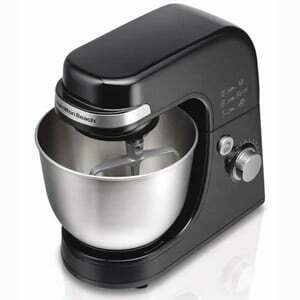 All stand mixers mentioned below are electric, portable and light-weight. They are quite handy and easy to clean. Also, most of the bowls and attachments are made of stainless steel and are dishwasher safe. The Hamilton Beach 63390 is a superior product for its price. This stand mixer has the design of your commercial grade mixers and has a strong 300-watt motor. The machine comes with a stainless steel mixing bowl and attachments that are actually wide enough to almost reach the sides of the bowls. The mixer comes with a large beater, whisk attachment and bread hooks. These attachments lock into the head of the mixer with ease and work in a planetary motion to ensure all areas of the bowl are covered and mixed completely. The mixer has 7 speeds for versatile mixing capabilities. The splash guard is a unique feature for the mixer. The hard plastic shield is placed over the bowl and keeps splatter from occurring. This also helps direct ingredients when you are adding them into the bowl. The mixer can be used with or without the splatter guard. This mixer is very capable for mixing just about any type of batter, in fact, you will not have any difficulty with any type of batter or dough. The bowl and all attachments can be placed into the dishwasher, and the surface of the machine can be wiped down with a damp cloth. The Hamilton Beach 6 speed stand mixer is a good mixer for anyone who makes smaller batches of food. The bowl only has a 3.5 quart capacity and this could be an issue for anyone who makes larger batches of batter or dough. The 300 watt motor is sufficient to get through bread dough and runs quietly in comparison. One of the few issues is the fact that the bowl does not move when in use. This leads to a lot of stopping the mixer and scraping the sides to ensure an even mix. However, the mixer itself does a really good job so that when the dough or batter is mixed it is done well. The mixer comes with a larger beater, whisk and bread hook attachment. All attachments lock in place and are easy to insert and remove. The mixed has a tendency to shake pretty hard once you hit the fifth speed. At the sixth speed, this is noticeable even more. However, since these speeds are used quite rarely, you may never encounter this problem. 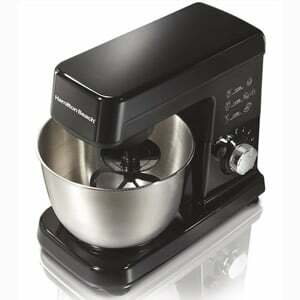 The Hamilton Beach 63325 6-speed mixer has a very modern, almost industrial, appearance. The overall look is enough to consider this mixer for your kitchen. The machine is equipped with a 300 watt motor and offers 6 different mixing speeds. One of the best features of this stand mixer is the fact that the attachments rotate within the bowl while they are mixing. This gives you a very even mixture, regardless of what type of batter is being prepared. The folding speed is also a bonus for those who wish to have the ultimate control over their batters. The suction cup feet allows the mixer to stay secure while it is mixing. Many other models bounce around on the table or counter which requires you to hover over it the machine the entire time it mixes. This mixer, however, allows you to move throughout the preparation area without worry. The machine comes with a paddle for batters, bread hooks and a whisk attachment. This allows you to prepare any type of mixture with ease. Even though the motor is only 300 watts, which is a bit lower than other models, it does not seem to have any difficulty getting through doughs or bread mixtures and making sure they are completely mixed. The machine runs quietly in comparison to other models and it does not overheat after extended use like many stand mixers have a tendency to do. However, just like any small motor, it is probably a good idea to let it rest in between batters. 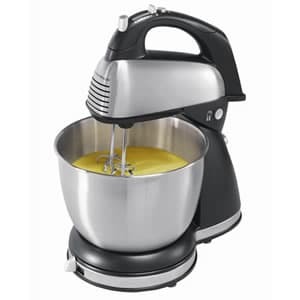 The Sunbeam 2594 MixMaster is a high quality stand mixer, especially when you consider the low price. The MixMaster has a strong 350 watt motor which is perfect for heavy batters or bread doughs. It also has 12 separate speeds and a “burst” function that will up the power of the mixing at any speed. The mixing quality of the machine is quite impressing. The offset design of the bowl allows the beaters to circle the outside of the bowl and significantly reduces splatter. There is little need to stop the mixer and scrape the sides or move batter from the middle of the bowl to be mixed. The mixer has a tilt function that allows easy access to the bowl while you are mixing and makes attaching the mixing blades much easier. A single push of a button releases the mixing utensils for easy cleaning. You can place all attachments and the locking bowl in the dishwasher, making life even easier. The rubber feet kept the mixer in place while in use. As for a whisk attachment – you can purchase it separately, just like with some of the more expensive models. Overall, this mixer is very pleasant to use, not too loud, does not shake the table too much in use, and has good mixing qualities. This mixer rightfully ranks first among inexpensive, but high-quality mixers. Hamilton Beach is well known as a reliable manufacturer of kitchen appliances. In this case, we have 2-in 1: if you unlock the mixer from the stand, you get a hand mixer. 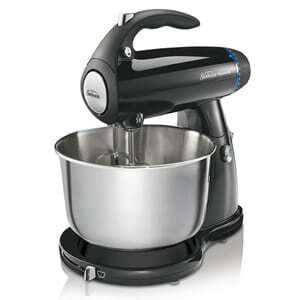 290 watts and 6 speeds will satisfy any need – from kneading a batch of sticky dough to whipping whites. The attachments are minimal: 2 traditional beaters, a whisk, and 2 dough hooks. 4-quart bowl is deep enough for the basic mixing needs. The base of the bowl is not motorized, but the bowl slowly spins by itself from the motion of the beaters. After use, be sure to wipe the beaters dry, otherwise, they can rust. Fortunately, you can always order a replacement from Hamilton Beach: both the attachments and the bowl. As a stand mixer, this unit demands large amounts of ingredients (at least 2 cups), because the beaters are not large enough for this bowl. Also, you should use dough hooks only in a “handheld” mode – as mentioned in the user’s guide. While working, do not leave the mixer unattended, cause too thick mix can cause a very fast bowl rotation. 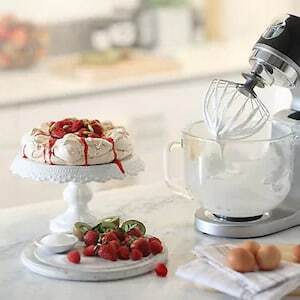 This mixer is a good buy for beginner bakers who have a small kitchen with not much storage space or for those who use a mixer on occasion, 2-3 times a month. With the press of a button, the stand mixer converts to a hand mixer if you need to mix a bigger batch of something in another bowl. As a stand mixer, it’s light (weighs less than 10 pounds) so it’s easy to pull out and to store. 3-quart stainless steel bowl locks onto a swivel base that spins around on its own. You can make it go faster or slower with your hand if you need. However, the beaters don’t touch the bottom of the bowl, so you have to scrape the sides as it mixes – especially when mixing doughs and batters. There are 5 speeds (and 0, which is “off”), plus a “boost” button for an added power at any speed. Beware, that at low speed this Sunbeam runs too fast, so it is not suitable for mixing. This model is available in 2 colors: black and white. And it comes with 2 chrome beaters and 2 dough hooks. 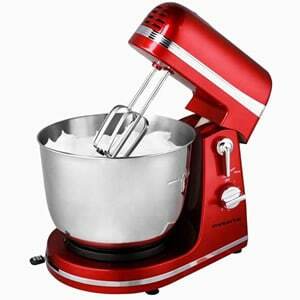 This mixer is available in 2 gorgeous colors: metallic red and silver. It has all-plastic parts, nevetheless, there are no complaints about breakage, moreover, it is lightweight. 300-Watt motor is also very reliable and this mixer will last long. On this, perhaps, the advantages of this mixer ends. All the speeds of this Ovente, even the very first ones, are excessively high. You can not mix the ingredients for the dough at a low speed, and when whipped at high speed, the entire mixture will scatter over the sides of the bowl. The light weight of the mixer has the opposite side – it is not stable enough and often starts jumping on the countertop. Unfortunately, we can not recommend this mixer, despite its attractive appearance and reliability. 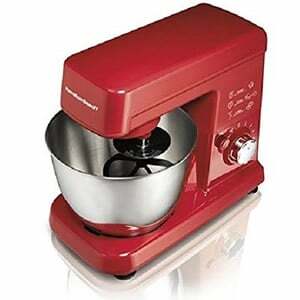 But if you are looking for a compact and reliable mixer of red color, we can advise another model – Hamilton Beach 6-Speed Stand Mixer. This mixer is the most compact (only 12.5″ tall) and weighs less than 5 lbs unlike other fairly heavy untis. It is made in retro design and you can choose one of 6 colos: Black, Copper, Mint Green, Pink, Red or White. 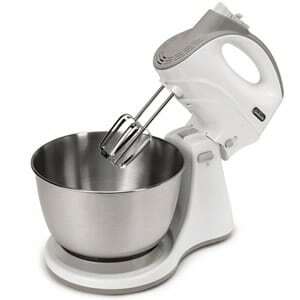 Dash Mixer comes with 3-quart stainless steel mixing bowl, 2 mixer beaters and 2 dough hooks, and little recipe book. You will also be provided with free access to the database of thousands of recipes. The control is as simple as possible: a single speed switch from 1 to 6. However, we do not recommend buying this mixer because of the insufficiently powerful 250-watt motor. In fact, it is only suitable for whipping, but not for kneading the dough. Of course, at such a cost, the bowl does not move around to get the sides when mixing. Since the beaters also do not reach the bottom of the bowl, a large amount of the mixture is not involved in the whipping and mixing process. After every three minutes of operation, you must turn off the mixer for cooling. If you plan to whip for a long time, this mixer can easily burn out, as it has no protection against overheating. Overall, when you are looking for a mixer you should seek out one that is designed for the types of foods you mist often prepare in this type of machine. Bread and heavy doughs should be made in a machine with a stronger motor and heavier attachments. Batters can be prepared in lighter duty machines. Make sure that the machine that you are purchasing is compatible with the type of power that your house runs. European design in the title can mean that it is made for the European power grid only or that its exterior is popular in that area. A final thing that you should look for is the type of attachments that are available with the machine. If it does not offer the type that you most often use, you should make sure that they are available separately so that you can get the most use from your new stand mixer. The best stand mixer is one that you can use for a wide variety of cooking styles. Of course, such appliance could not be very cheap, but it will save you money in the long run as well as a ton of counter space. Most stand mixers come with several attachments and others have optional tools that you can add as you get more familiar with using it. 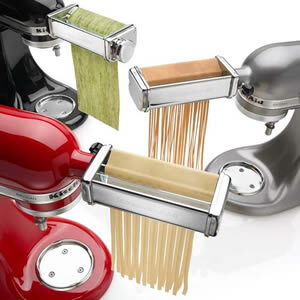 Pasta Attachments for making every size and shape of pasta imaginable. Not only do these tools allow you to press and cut your own pasta at home, you can use the stand mixer to do everything from mixing the dough to the final cutting whether you are making spaghetti, lasagna or even the more complicated ravioli pasta. Vegetable and fruit peelers which allow you to make quick work of a full basket of fruit for jams, jellies and pies. You can also peel vegetables or even make vegetable noodles for a healthy take on your favorite dishes. A food processing attachment lets you do everything that you would use a food processor for without the need for a separate appliance. You can grind, dice, slice and juice, make homemade ice cream and more. 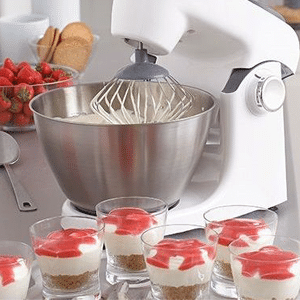 In addition to these tools you will also have standard mixer tools such as the beaters, the dough hook and the whisk so that you can make your family’s favorite cakes, breads and other baked goods. Having more than bowl lets you make several items at one time without having to stop and clean in between each item. There is no limit to what you can make with a good stand mixer even without the additional tools and attachments. Anything you can make with a hand mixer will be even easier with a stand mixer. Whether you have the top of the line or a cheap stand mixer, the process of using one is fairly easy once you get the hang of it. There are slight variations to the knobs and levers from model to model so your first step should be to read the instruction manual carefully. Get accustomed to each part before you attempt to make your first recipe. For the average stand mixer, the next step is picking the correct attachment. There is a lever that allows you to insert the attachment and then lock it in place. Before turning your machine on, make sure that your attachment is snugly locked by pulling down gently. Next, place the mixing bowl on to the stand and make sure that it too is firmly in place. Some mixers have a feature that locks the bowl in place for added security. Your mixer head should have another lever that allows you to tilt it backwards and out of the way so that you can add ingredients in to the bowl. Never try to do this while the mixer is running. Once everything is in the bowl, lower the mixer head and then turn the machine on at low speed, gradually increasing speed as directed in your recipe. This allows for better incorporation of ingredients and reduces the mess factor. You can add additional ingredients while the mixer is running but be cautious about the moving parts. Once the mixing is finished, you should stop the machine and then raise the mixer head to remove the bowl. Using the lever, remove the attachment and make sure that it is clean and dry before replacing it or putting it away for storage. Make sure that you wipe any splatters off of the machine itself using a damp cloth. How Much Does a Stand Mixer Weigh? Every make and model of stand mixer is different but the average weight is around 20 pounds. These are the usual ones that you find in stores or online but there are others that have higher powered motors that may weigh a bit more. The materials that are used for the bowls and the attachments may also increase weight – thinner metal bowls will weigh less than the glass ones. Most of the tools are metal and are fairly light. The dough hook may be the exception here and may add the most weight of the tools. Some posts may contain affiliate links. BestCheap.online is a participant in the Amazon Services LLC Associates Program, an affiliate advertising program designed to provide a means for sites to earn advertising fees by advertising and linking to Amazon.com.